Product #16213 | SKU TP300-B | 0.0 (no ratings yet) Thanks for your rating! 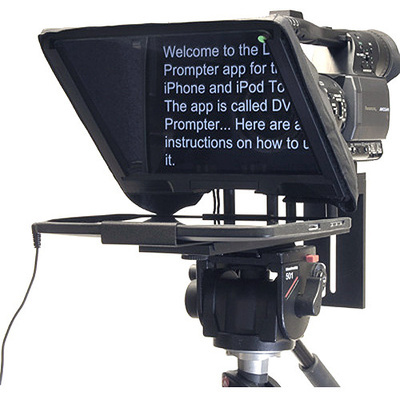 The Datavideo TP-300B Prompter Kit for iPad and Android Tablets with Bluetooth/Wired Remote works with your iPad or Android tablet running Datavideo's free DV Prompter software, and the included remote control is approved to work with the downloadable DV Prompter software. The prompter's cradle is adjustable, allowing it to accept tablets ranging from 4.1" to 7.8" wide. The prompter uses 60/40 partially silvered glass to reflect the text from your iPad toward the talent. The glass is labelled with red and green stickers that identify which side faces your camera's lens when you first assemble the unit, or after removing the glass for cleaning. Included with the prompter are two riser blocks, so you can centre your camera. Hook-and-loop fasteners allow you to attach the lens hood to prevent light from flaring the mirrored glass. When shooting exteriors, you can attach the included side curtains for additional protection from glare. You can mount the camera directly to the prompter frame, or use the included riser blocks to position the camera in the centre of the glass. The adjustable cradle can be mounted in standard prompting position or in a below-the-lens configuration if the situation presents itself. The included remote can connect to your tablet by Bluetooth or wired connection. To connect the remote to your tablet, use the 9' long cable. Charging of the remote is accomplished via an optional USB charger or by connecting it to your computer via the included USB charging cable. Please Note: The remote only supports the free downloadable DV Prompter software, and is not known to work with other software. The prompter is designed to be used with camcorders and DSLR cameras, and features removable riser blocks for centring adjustments. For use with select iPads and Android tablets. Prompter frame is designed to allow standard, or below-the-lens prompting. Black camera hood is adjustable to adapt for a wide variety of cameras. Quick, and simple assembly that requires no special tooling. Flexible mounting bracket system allows simple but secure installation of a tablet. The foam that comes in the shipping carton can be removed and placed in an optional HC-500 storage case.